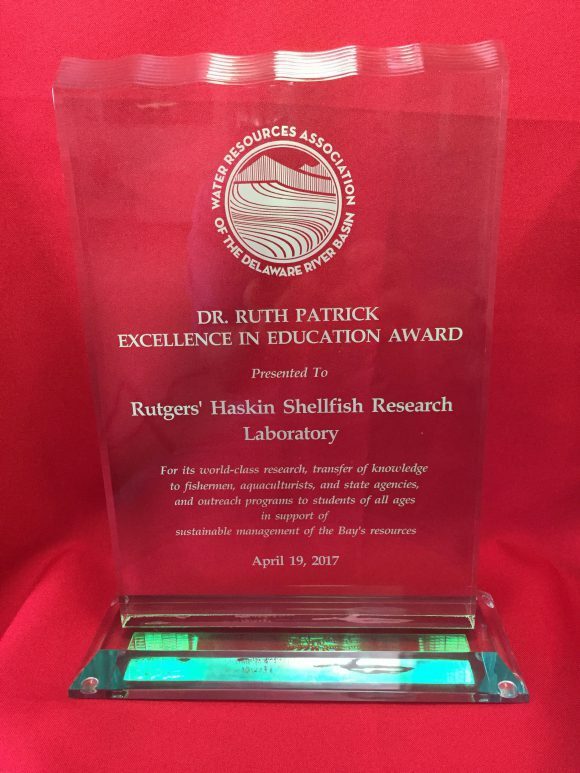 Share the post "Dr. Ruth Patrick Excellence in Education Award Given to the Rutgers Haskin Shellfish Research Laboratory"
Dr. Ruth Patrick Excellence in Education Award. The Water Resources Association (WRA) of The Delaware River Basin bestowed the Ruth Patrick Excellence in Education Award on the Rutgers Haskin Shellfish Research Laboratory (HSRL) at its 35th Annual Recognition Program on April 19, 2017. The HSRL received the award for its world-class research, transfer of knowledge to fishermen, aquaculturists, and state agencies, and outreach programs to students of all ages in support of sustainable management of the Bay’s resources. The WRA is a non-profit, non-partisan advocacy and public information organization whose mission is to promote sound water resources management within the Delaware River Basin. The WRA represents water users and those dependent or interested in the Basin’s water resources. 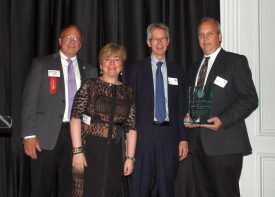 (L to R) Preston Luewieler, chairman WRA Board of Directors; Kathy Klein, president WRA; Brad Hillman, senior associate director, NJAES and director of Research; David Bushek, director, Haskin Shellfish Research Laboratory and associate professor, Department of Marine and Coastal Sciences. Dave Bushek, director of the HSRL and associate professor, accepted the award. He noted that it was particularly special because the first Ruth Patrick Award was given to Hal Haskin and his wife Peg who dedicated their lives to education and research with the Delaware River and Bay as a primary focus. “It’s an honor to accept this award on behalf of the Haskin Lab and the many staff that work so hard day in and day out,” said Bushek. Research in shellfisheries at Rutgers began in 1888 when Julius Nelson was hired as the biologist for the newly formed New Jersey Agricultural Experiment Station and then persuaded the Experiment Station to establish a Department of Oyster Culture at Rutgers. In 1901, the New Jersey Legislature recognized the value of Nelson’s work by passing legislation directing the NJAES to establish one or more research stations to support its mission of providing scientific assistance to the oyster industry, known today as the Haskin Shellfish Research Laboratory with four stations located along lower Delaware Bay from Port Norris to Cape May. Oysters have been a constant theme, with early research guiding oystermen on when to plant clean shells to catch larvae when they set. When disease devastated the oyster grounds, Hal Haskin began an intensive breeding program, the first for molluscan shellfish, which has produced some of the most valued disease-resistant stocks of East Coast oysters and is helping to fuel an oyster renaissance today. 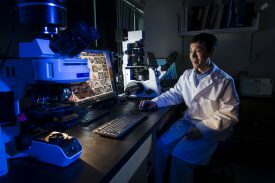 More recently, Professor Ximing Guo developed the technology to produce ‘seedless’ oysters that grow faster and larger because they don’t spawn. Over the years, successive directors have each expanded HSRL’s research. Harold Haskin, the first recipient of WRA’s Ruth Patrick Award, branched out to include hard clams and surf clams, thereby creating the foundation for existing management plans. Richard Lutz envisioned a multispecies aquaculture demonstration facility that ultimately opened in 2008 as the NJ Aquaculture Innovation Center in North Cape May. Eric Powell brought expertise in mathematical modeling of fish and shellfish populations, paleoecology, and expanded offshore fisheries research programs. The current director, David Bushek, brings expertise in estuarine ecology, shellfish pathology and restoration science. The Lab has developed and maintained a national and international reputation for work on shellfish and estuarine systems with the Delaware Estuary as the model system for study, teaching and training. Current research areas include aquaculture, fisheries, bacteriology, ecology, genetics and breeding, numerical modeling, pathobiology and shellfish restoration. The Laboratory has a variety of outreach programs, including a K-12 program called PORTS (Promoting Oyster Restoration Through Schools) that has been copied nationally. Developed by Lisa Calvo, the project has reached thousands of children, largely in rural communities providing them with STEM education opportunities.